The jailbreak for iOS 8 and (iOS 8.1) was already out for quite some weeks now but the problem was that jailbreakers couldn't simply install Cydia on their devices because the Pangu Jailbreak tool didn't come with an integrated Cydia Installer. Actually, not anymore and today we are going to explain how to jailbreak your iOS device and install Cydia right out of the box without going through the complicated (SSH method) with very simple steps to enjoy the ultimate jailbreaking experience on your iPhone, iPad or iPod. Well, there is only one supported device here which is iPod Touch 5G. How to Jailbreak with Pangu Tool? First you need to make sure to prepare your device so it is ready to get jailbroken. So, make sure you follow these steps in order to go safely with no problems. Make sure that you make a fresh restore to your iPhone or iPad through iTunes. Disable Find My iPhone feature on your iOS device (Setting > iCloud > Find My iPhone) then turn it off. Disable Passcode feature on your iOS device (Settings > Passcode) and turn it off. You must install iTunes on your PC (if not already) and connect your iOS device to it (if your device didn't get recognized by iTunes then jailbreak will not work). Put your hands on the required Pangu tool and iTunes from the download section below. Now, assuming that you have already connected your device to your PC to get recognized by iTunes, open Pangu Jailbreak tool with right click then (Run as administrator) and wait for it to recognize your connected device as well. Make sure you uncheck the box shown on the picture because it will install unnecessary software if not unchecked then click on the jailbreak button. If you follow these instructions well then you should have no problems jailbreaking your device. There is only one thing left, getting the Cydia Installer to put the last magic touches to your device by following steps below. 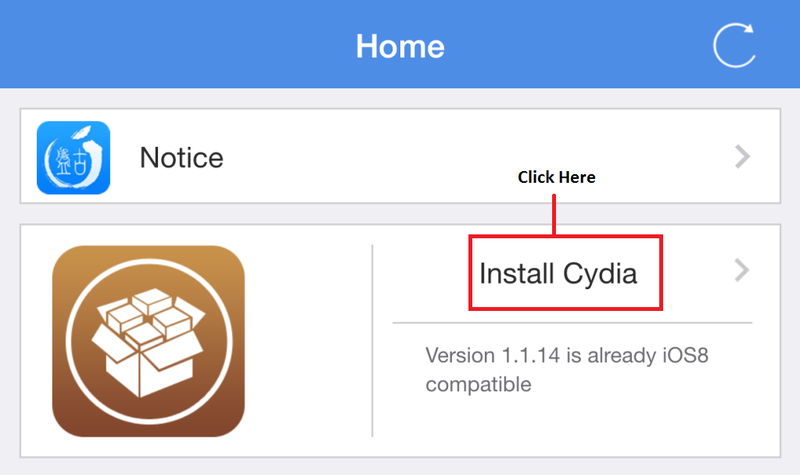 How to install Cydia with Pangu? Finally, now it is getting simpler because Pangua Jailbreak Team has finally integrated an installed for Cydia on their Pangu App (which was installed by default when you jailbroke your device). Well, just launch that application on your iOS device and click on Install Cydia as shown in the picture above then wait for it to finish. After that, open Cydia and let it configure itself and that's it, easy breezy! Here you can find all the links that you need to download the required software for jailbreaking and installing Cydia on your device.